I came to awareness of the adult world during the age of Watergate. My parents never spoke about politics to us kids, being fairly apolitical, if generally right-leaning, but my best friend Laura's mother was a fervent Democrat and I had been recruited by her to come along with her and Laura, putting George McGovern flyers in mailboxes around the neighborhood. My very first introduction to politics. While I was attending Our Lady of Fatima school we had a school assembly with a lawyer, I have no idea why. But during the Q and A I took the opportunity to raise my hand and ask: "can you explain Watergate?" As I remember it, this brought the house down - or at least the nuns and the lawyer laughed and shook their heads. I forgot what the lawyer said in response, but he did not explain Watergate. Looking back now, they were probably all Republicans and it was probably a distasteful subject to them. One of my most enduring memories of Laura's mother was her spending hours every day on her sofa watching the Watergate hearings. My family moved away from that neighborhood, to Pennsauken New Jersey, as the Watergate train rolled along and my adolescence kicked in. The book "All the President's Men" was release and the woman I babysat for had a copy so I read it. 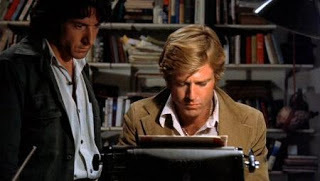 Then when I went on my first date with my first real boyfriend, I chose the film we would see - the movie version of "All the President's Men." I've watched that film several times since and went to an event - is it really almost eight years ago? - at the Brooklyn Academy of Music with Redford, Woodward and Bernstein. So now we have the Trump administration which seems will inevitably end in resignation or impeachment. Or given Trump's age and bad personal health habits, possibly a heart attack. Although I wouldn't completely rule out the Trump presidency ending with Trump, one step ahead of treason proceedings, being granted asylum in Russia, while other people, including Jared and Ivanka, are left holding the bag. "One thing about Watergate, it was going to change the culture of Washington. It did no such thing. Of course this kind of thing is going to happen again and it's going to happen on a much much bigger scale." This was four years ago, when the prospect of a Donald Trump presidency was still a punchline.